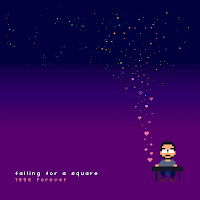 Pxl-Bot: PB084 | Falling For A Square - 1996. Forever. PB084 | Falling For A Square - 1996. Forever. Making a second appearance on Pxl-Bot, Falling For A Square brings with him a, quite simply, beautiful new album. Described by Falling For A Square as a mini recording focusing on heart strings, heartbreaks, death, truth, commuting and crushes of long ago, "1996. Forever." is a journey through the nuances of love and life, portrayed with perfect execution. Emotions are woven around wonderfully crafted melodies, emerging in each track and pulling you into the story being told, as well as immersing you in a world of your own memories. The already strong atmosphere is strengthened further by the mixture of guitar and vocals with more standard chiptune, bringing with it intoxicating depth, character and life. With mastering by Brian Slusher and artwork by Andrew Gleeson, we proudly release this must-not-miss piece of emotively strong chip. Grab the ZIP Here! or On Bandcamp Here!